Pursuing a sport with a touch of elegant appearance, now seemed to inspire some young modifier, Fikri Lahzi no exception. For him, the Toyota Avanza Year 2006 lansiran pretty face to make just a little, do not need because it is still too extreme for everyday use. However, this arrangement covers nearly the entire exterior. It's not a lot of modifications, most importantly, let the delicious but simple modifications, "said Fikri registered as private employees in Cikarang area. 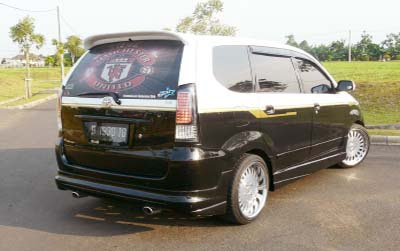 Like the exterior given only cut the white sticker and some images such as Horse Dancing on the hood and also the Manchester United team logo on the glass behind the team is his idol. 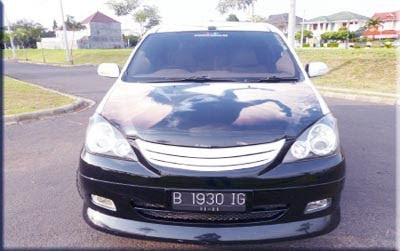 The exterior looks simple, Fikri Avanzanya inspired to create the name of Black Beauty. In the interior sector, Avanza, as a family car, of course, have a fairly comfortable passenger cabin. But this does not make Fikri satisfied with the standard view of Avanza. 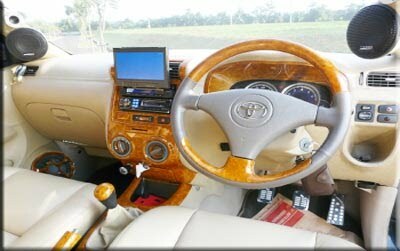 The whole joknya coated with full leather interior and other such Autoleather doortrim, dashboard, door handles and other parts are also covered by wood panels Masterpiece. While for the sector, legs, Fikri also improve the system by modifying a little touch of the foot. Proceed to the audio, Avanza, which also functions as an entertainment center, making Fikri give special attention to the audio sector. Therefore, he gave up the trunk of your car serves as the audio. 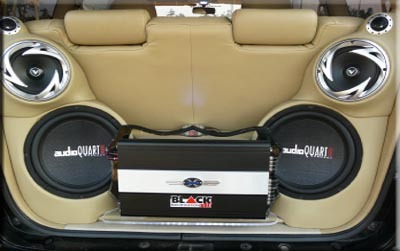 As the head unit is equipped with monitors indash 7 "as well as audio devices, which are often used devices, such as power amplifiers, subwoofers, midrange speakers Auto Quart tweeters, and capacitor banks.